25 February 2016, at 6:00a.m. EU - As expected, the EU pig breeding herd declined during 2015, following the difficult financial conditions faced by producers during the year, according to the UK's AHDB Pork. However, a further 5 per cent growth in the EU’s largest sow herd, Spain’s, limited the overall fall to a little over 2 per cent. This is based on figures from 21 member states which, between them, account for 88 per cent of the EU herd. Although declines are likely in the remaining countries, which include Belgium and Romania, this is unlikely to have much impact on the overall picture. There was a slightly larger fall in the number of in-pigs sows and gilts but this was still less than 3 per cent. 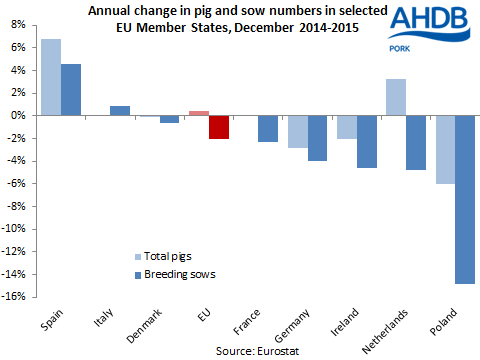 The overall pig herd across the countries which have reported was almost unchanged. The relentless growth of the Spanish herd means that it has now overtaken Germany’s as the EU’s largest for the first time. The census figures suggest that at most a modest tightening of supplies can be expected across the EU during 2016. If this proves to be the case, then any price recovery could be slow. However, with a 4 per cent fall in the breeding herd if Spain is excluded, supplies are likely to be tighter in northern Europe. Given that it is this region which typically drives the EU price, the prospects for a strengthening of the market may be a little better than the EU-wide picture suggests. Nevertheless, competition from Spanish pork may limit price rises to some extent. With UK price recovery partly dependent on developments in the EU, much will rely on how the pound-euro exchange rate moves. Any further weakening of the pound could increase the speed of EU price recovery in sterling terms, adding to any resulting support for domestic prices.